what would be (historically correct) the lenght of the chain of a flail? If someone Has an answer please Help me!!! About half as long as the stick you use to hold it. Or, in other words, generally short enough that the head won't acidentally strike the hand holding the haft. A simple matter of common sense, really. On existing historical pieces and period artwork, the actual length varies from just a few links, really little more than an articulated joint, to well over a yard. There are also a few - very few - examples with a chain so long it reaches well past the end of the haft and the gripping hand. Personally, I like the better control a shorter chain provides. A longer chain can potentially increase the momentum of the head, and wrap farther around parrying weapons, but, generally, I find the trade-off in control not worth it. There are also a few - very few - examples with a chain so long it reaches well past the end of the haft and the gripping hand. I am most curious to know more. And, even if my recollection is accurate and the weapon's proportions are original, it's still an extremely rare specimen. An aberration, really. The best I can some up with right now is a vaguely recalled picture in Weapons: An International Encyclopedia From 5000 B.C. to 2000 A.D. There are actually a couple short-hafted flail flails in the Diagram Group's Weapons: An International Encyclopedia. 1. Swiss Morning star mace, c. 1530. The chain (including ball) is slightly shorter than the haft, which is about 50 cm based on their scale. The chain ends in a rather large spiked ball. 2. German morning star with short chain, 16th century. The chain is about 10 cm long, the haft a bit under 40 cm. The ball at the end of the chain is smaller than the ball in number 1, but the spikes are thicker. 3. 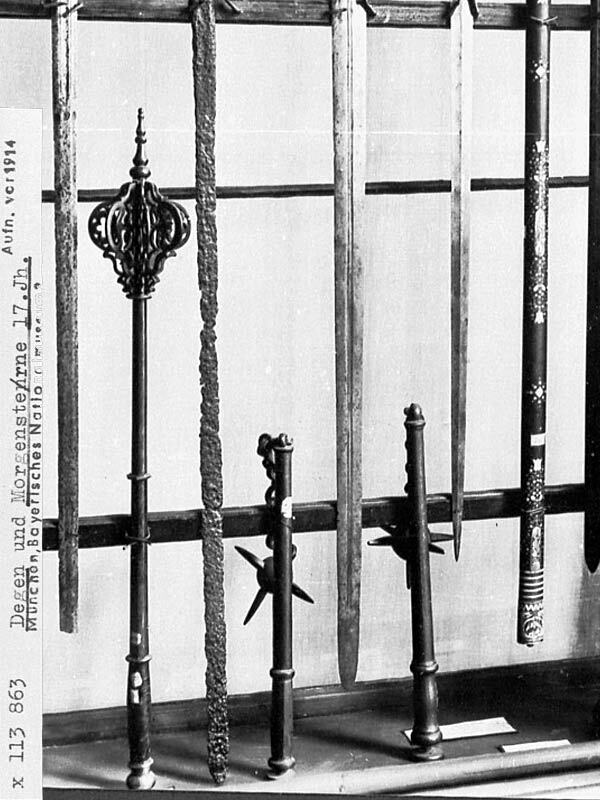 German one-handed war-flail, wooden with iron mounts. Probably 17th century. The haft is about 35 cm long, the flail linked by a sort of "toggle" (like a single link of chain). The "business" end of the flail, sporting a few spikes, is about 15 cm long. 4. Indian flail with two balls and chains. 19th century. In this case the chains are longer than the handle. The haft is about 50 cm long, and the chains are about 65 cm long. The balls are rather small, and plain (no spikes). 5. Unusually short French morning star, without spikes, 15th century. The handle is fit for one-hand only, being less than 20 cm long. The chain, including ball, is about the same length, or a bit longer. 6. 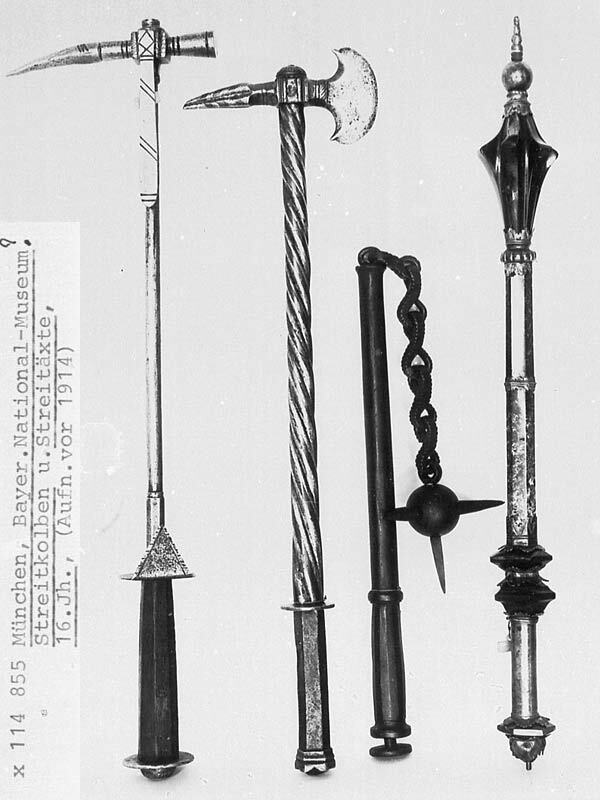 Short German triple-headed iron flail, 15th century. Again, the handle is only fit for one hand. Perhaps it was originally mounted on a wooden haft; it depends upon whether the handle is hollow or solid. If it's solid, it obviously was meant for one-hand. The handle is a bit under 20 cm. while the chains are about 20 cm long (a bit longer than the haft). The three chains each end in a "squarish" ball. The same work also shows a figure wielding a Japanese chigirki, a rather long-hafted and long-chained flail. The chain on this examples appears to be a bit longer than the long, two-handed haft. My measurements are only estimates based on the scale of the drawings in the book (they have scale indicators in each plate), but I hope this helped! By the way, George Cameron Stone shows many of these in a photo in A Glossary of the Construction, Decoration, and Use of Arms and Armor in All Countries and in All Times. He includes some measurements of the handles (in inches), but not the chains. According to Stone, the length of the handle of number 4 (Indian flail with two balls and chains) is 19.5 inches. He lists the length (possibly total length in this case) of number 3 (one-handed flail) as 20 inches. 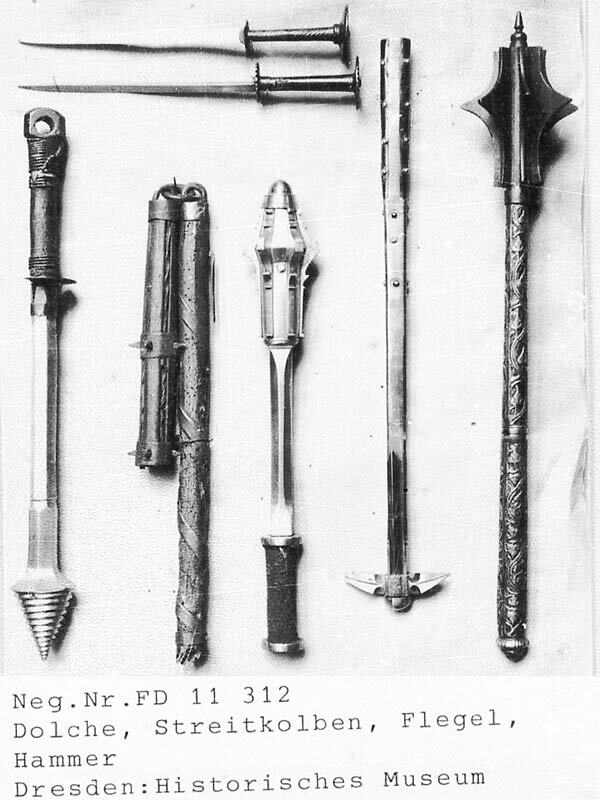 I've found the description of a very interesting military flail in Medieval Costume, Armour and Weapons by Eduard Wagner, Zoroslava Drobna, and Jan Durdik. It is (or was) in the Military Museum in Prague. It supposedly has a sword pommel as the ball at the end of the chain! Here are the measurements: pommel 5.5 X 4.2 cm, the stave 68.5 cm long (about 27 inches), the links of the chain 6.5 X 2.5 cm, the chain itself 31 cm long (about 12 inches). In the same work, they show an illustration of a flail that consists of a wooden ball stuck with 13 forged nails suspended from a chain on a haft 57 cm (about 22 1/2 inches) long. The ball and chain together are about the same length as the handle. So this gives a few more measurements for military flails. It seems there was definitely a variation in the length of the chains. "Weapons: An International Encyclopedia From 5000 B.C. to 2000 A.D."
George Cameron Stone's "A Glossary of the Construction, Decoration, and...."
Does anyone have any colour photos or other pics of some of these flails especially the Swiss one? Thanks for posting those! These are the same sources that I used in some of my previous posts. I used the scale in the Diagram book Weapons: An International Encyclopedia from 5000 BC to 2000 AD to determine the approximate lengths of the hafts and chains. The Stone book also had measurements for a couple of the flails. His measurements seemed to match those in the Diagram book. It's nice to have pictures posted for everyone to see! Thanks all for helping me for the chain!! !